Probably much to the chagrin of my roommate I’ve been listening to Paul Simon’s Graceland a lot lately, and something about that record strikes me about it being about memories and nostalgia for the past. Maybe it’s the gloriously dated synthesizers that give “You Can Call Me Al” its charm (say what you will about that song, but I unabashedly love it) or the fact that Simon was middle-aged when it was released, who knows. In the middle of my Graceland-revisiting period I woke Tuesday morning to the sad news that Brett Favre has announced his retirement. Yeah, Brett Favre. Retiring. 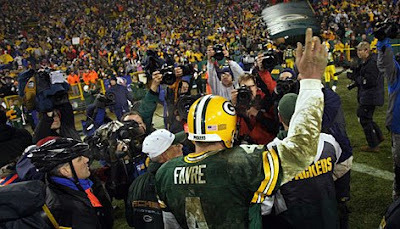 For years, Favre kept the Packers faithful in suspense as he contemplated and flirted with retirement for years. For the Cheeseheads, one more season just wasn’t enough and after his teary-eyed speech after beating the rival Bears in the last game of the season, he came back with a spirit we hadn’t seen in years and brought the Packers back to the NFC Championship. The rest, I’m sure you know, is history. Brett left the field that day with his last pass an interception that sealed a loss for his Packers in overtime. That’s when I confidently declared to my roommate, “Brett’s playing one more year, there’s no way he’s letting his last career pass be an interception that kept him out of the Super Bowl.” I also predicted the Niners to be the NFC West champs. Already there’s speculation that he’ll be back, possibly with another team. His abilities are clearly still there, but is his heart? He says he’s tired, and rumor has it that Packers GM Ted Thompson didn’t want him back. I can’t see him in anything other than that green #4 jersey; it’d be like me feeling so betrayed when I saw Joe Montana in a Chiefs uniform. Will Brett be back? I doubt it, but don’t ask me. I already told you how bad I am at predicting things. Favre won’t go down as the absolute greatest quarterback of all time. His passing records are only a few years away from having Peyton Manning shatter them. He only has one Super Bowl ring. But in our hearts, he’ll be the greatest football player of all time. The joy he brought from just watching him will never be matched and the fact he maintained his high level of playing through his late 30s is what makes him truly unique among the G.O.A.T.s of football. Originally I intended this post to be overwrought with adoration to parody the countless numbers of columns expressing grief and remorse over Favre’s retirement (half of those are written by Peter King). Somewhere I was going to write something about the ghosts of his father, Curly Lambeau, and Vince Lombardi were helping those passes land in the arms of Donald Driver and Greg Jennings. But any sports column of that variety already borders upon parody. I miss you already, Brett.